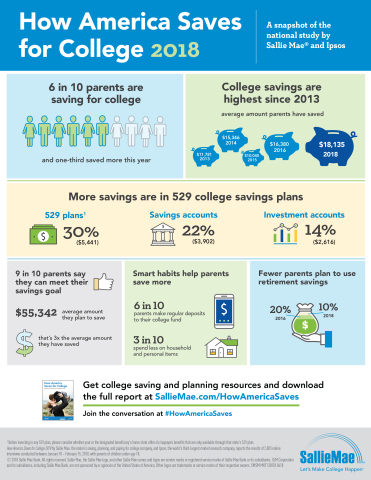 "This year’s report findings reflect America’s rising consumer confidence levels overall"
NEWARK, Del.--(BUSINESS WIRE)--Nearly six in 10 parents are saving for college, one-third saved more this year than last, and the average amount saved — $18,135 — is the highest amount reported in the last five years of “How America Saves for College,” the national study released today by Sallie Mae — the nation’s saving, planning, and paying for college company — and Ipsos, an independent global market research company. After saving for general needs and emergencies, parents earmark funds for college more than for any other specific purpose, alongside retirement. Only 10 percent of parents plan to tap their retirement funds for college, down from 20 percent in 2016 — the last time this report was published. To keep their college savings on track, six in 10 parents (61 percent) contribute a set amount to their college fund on a regular basis. To find more money for college, 30 percent of parents have cut back on discretionary spending, and 27 percent have reduced their household expenses. This year marks the first time tax-advantaged 529 college savings plans hold the largest share of college savings — 30 percent. 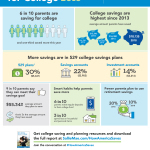 That said, fewer than one-third of parents saving for college are using them (29 percent). Most parents who are not using 529 plans report not being aware of or knowing enough about them, or not having enough money to invest in them. 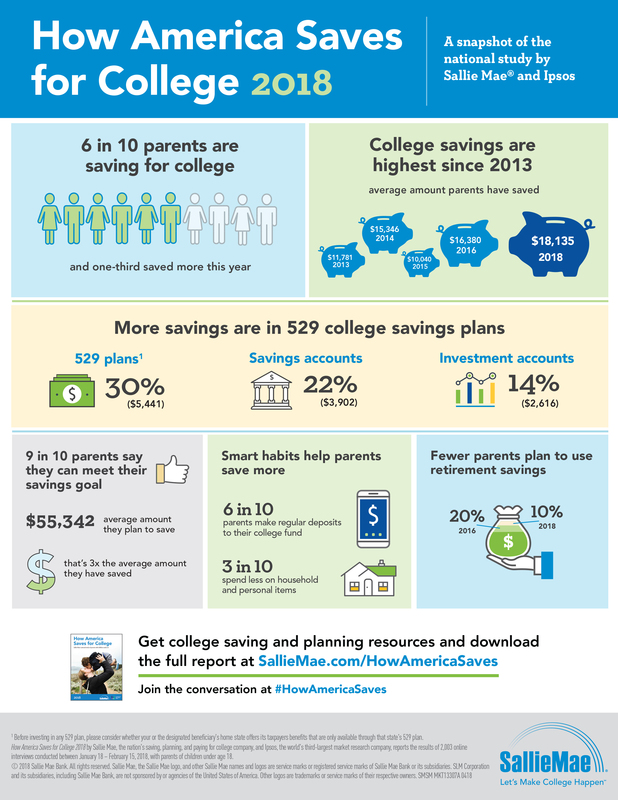 “How America Saves for College 2018” reports the results of online interviews Ipsos conducted in January and February 2018 of 2,003 American parents with at least one child younger than 18. The report and a related infographic are available at SallieMae.com/HowAmericaSaves. Join the conversation on social media with #HowAmericaSaves. Sallie Mae and Wise Bread will co-host a Twitter chat to discuss the report on Thursday, May 24, at 3 p.m. EDT. Follow the chat using #HowAmericaSaves and #WBChat. Sallie Mae recommends the 1-2-3 approach to saving for college: first, open a savings account; second, set a goal and make deposits regularly; and third, explore tax-advantaged options such as 529 college savings plans.